We'll use this to calculate your taxes and needs in retirement. What age will you elect Social Security benefits? We'll use this to calculate your Social Security income in retirement. We automatically distribute your contribution optimally among different retirement accounts. What do you estimate your annual expenses will be during retirement? Add your 401(k), 403(b), or 457(b) account details. Add the type of retirement accounts available to you and the current balances. Add your IRA account details. Add your IRA accounts and the current balances. Add your Pension type and amount. Add your Cash Savings and Investments balance. This does not include your Retirement Accounts (401k, IRA, Pension). We place the money you indicate as your monthly savings into the retirement accounts where it would provide you with the greatest overall benefit. Below, we show you average figures of where your retirement income will come from. To figure out how much you need to save for retirement we first calculate how much money we expect you will spend over the course of your retirement. This means looking at the income you will need based on your lifestyle preference, then factoring in the number of years in your retirement (we assume you live to 95). Once we have a good idea of your total need in retirement we use our models to analyze your existing resources. This means estimating your retirement income from Social Security and the impact of current savings plans, pensions and other retirement accounts. In our analysis we include the tax impact of these items so we do not overestimate your retirement income. We then do some fancy math to calculate the savings you will need to have built at the time of retirement, based on your needs and resources, to sustain your desired lifestyle. Lifespan: We assume you will live to 95. We stop the analysis there, regardless of your spouse's age. Retirement accounts: We automatically distribute your savings optimally among different retirement accounts. We assume that the contribution limits for your retirement accounts increase with inflation. Taxes: We calculate taxes on a federal, state and local level. The tax implications of different tax-advantaged retirement accounts, Social Security income and other sources of retirement income are all considered in our models. To better align with filing season, tax calculations are based on the tax filing calendar, therefore calculations prior to April are based on the previous years tax rules. Social Security: We estimate your Social Security income, using your stated annual income and assuming you have worked and paid Social Security taxes for 35 years prior to retirement. Our estimate is sensitive to penalties for early retirement and credits for delaying claiming Social Security benefits. Return on savings: We assume the return on savings is the same percentage across different savings instruments. Jim Barnash is a Certified Financial Planner with more than four decades of experience. SmartAsset’s retirement expert is passionate about helping both individuals and business owners prepare for retirement. Jim has run his own advisory firm, worked for large financial services companies and even acted as a consultant to help other advisors grow their businesses. He is an author and public speaker on a variety of financial topics. Jim previously served for six years as President and Chairman for the Financial Planning Association. He also instructs others about the topic – Jim has created and taught courses on financial planning at DePaul University and William Rainey Harper Community College. For a working person, the golden years of retirement can be both easy and difficult to imagine. We may fantasize about international adventures or beachside escapes, but rarely do we lay the groundwork for realizing our retirement dreams financially. There are, after all, more immediate concerns: job, kids, mortgage payments, car payments—the list goes on. Amid this daily grind, it’s easy to put retirement savings on the back burner, especially when it’s 15, 20 or 30 years off. Indeed, surveys have repeatedly shown that the average American retirement savings is too low and that significant numbers of Americans in their 30s, 40s and even 50s have no retirement savings at all. Needless to say, the save-nothing approach is not recommended. At its best, retirement is a time when the stresses of years one through sixty-five (or so) fade, leaving room for relaxation, delectation and grandchildren. If money is scarce, however, financial anxiety could crowd these pleasures out. Want to know how to retire comfortably? Start saving. On the other hand, just as it’s unwise to save nothing at all, it’s unrealistic to try and save every penny that isn’t already dedicated to paying bills or buying groceries. For most retirees, there are other sources of retirement income besides savings, Social Security being chief among them. The common assumption is that some savings, in addition to Social Security and a less expensive lifestyle (no more kids in the house, no more commuting costs) will all add up to financial security in our sunset years. To put it another way: it’s common to assume that if we save in good faith, things will work themselves out. For some, that may turn out to be true, but such success stories are more a result of good luck than a sound retirement strategy. That phrase — sound retirement strategy — is where many of us lose interest. It is loaded with negative connotations: expensive investment advisors, large stacks of documents and complex spreadsheets, to name a few. But a sound retirement savings plan doesn’t have to be complicated. It can be boiled down to one simple question: How much do I need to save to retire? By putting away a percentage of your income every month from now until you retire, you can do away with the financial anxieties far too many seniors find themselves facing. A retirement calculator can help. Living the good life: How much do I need to retire? 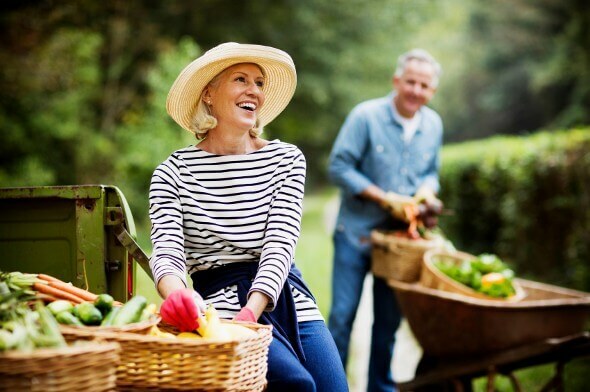 To figure out exactly what it will take to retire in comfort, it’s important to consider what kind of lifestyle you expect to lead in retirement. Do you hope to travel? To Paris, or someplace a little cheaper? How often do you want to eat out? Go to the movies? The beach? Do you want to move closer to the beach? The grandchildren? These questions may seem trivial now, but they can help give you an idea about the income you’ll need in the future. If you’re set on seeing the Eiffel tower, the Pyramids at Giza and the Taj Mahal, you’re going to need a sizeable nest egg to draw upon. On the other hand, if you expect to live a rather low-key lifestyle, with far fewer expenses than you currently have, you won’t need to save quite as much. The important thing is to be realistic. Don’t shortchange your future self by assuming you can live off of canned tuna and scrambled eggs. While some costs will likely go down in retirement, others may go up. Specifically healthcare costs are likely to rise in retirement. So it’s best to have a cushion for unpredictable costs like that. Plus, retirement is your reward for decades of hard work: treat yourself accordingly. Saving for retirement: Where are you now? Whether you plan to live lavishly or frugally, you’ll need to have a certain amount of money saved by the time you retire. Think of this figure as a mountain summit, reachable by several different paths. If you’ve done everything right so far, that summit is still in plain view; you’ve followed the most direct and least difficult path, and all you need to do is continue on in the same direction. If, however, your savings aren’t where they should be, it’s as if you’ve wandered in the wrong direction—you’ll need to recalibrate and start climbing in order to reach the summit. How much have I saved thus far? How many years until I retire? What’s my annual income (and how much of that do I want to replace)? The answers to those questions will determine how much work you have to do to reach that mountaintop. If you’ve saved plenty and you’re still young, great—you’re well on your way. If you’ve saved nothing and your sixties are just around the corner, not so much. Let’s check out some examples using our retirement calculator to see how this works in reality. Let’s begin with a best case scenario: you’re 25, and you’ve only been working a few years before you decide to get smart about your retirement. You live in a mid-sized city, let’s say Tulsa (Oklahoma!) where you earn $45,000 per year. You currently have $5,000 in your savings account, and by saving $100 per month you manage to put another $5,000 in your 401(k). Your employer has promised to match 100% of your contributions to the retirement savings account, up to 5% of your total income. After thinking it over, you decide that you would be comfortable living a lifestyle similar to your current one in retirement. Assuming a rate of return on your investments around 4%, you would have to save about $176 per month from now until you turn 67 to retire comfortably. Not bad! If you continue on your current path, however, you'll be over $260,000 short of your retirement goal when the time comes. Getting an early start on retirement savings can make a big difference in the long run. 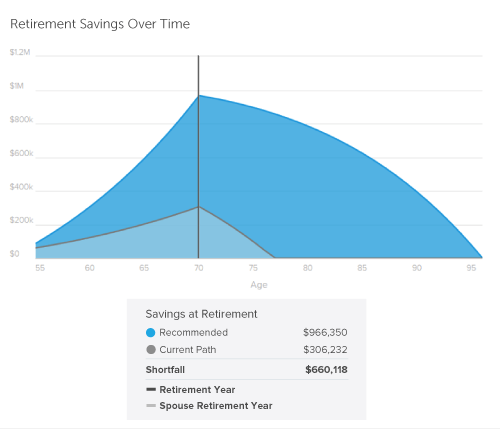 By saving an extra $76 per month, this 25 year-old can close the $265,261 shortfall projected by SmartAsset’s retirement calculator. Let’s try another one. You’ve just turned 40, and it suddenly dawns on you that you’ve not been focusing on your eventual retirement. Fortunately, you’ve been able to put away some solid savings over the years: you’ve got $25,000 in the bank and another $12,000 stored in a traditional IRA. You now live in Pittsburgh, where you earn $75,000 per year. Now that you’re older and wiser, you’re a little bit more optimistic about your investments, and so you assume a 5% annual return. You also plan on living fairly modestly once you retire, and think your budget will be a bit trimmer than it is today. Under this scenario, you’d only have to save about 7.5% of your income, or about $469 per month, from now until your 67th birthday - less than you are already saving! This Pittsburgh resident is right on track for a happy retirement. SmartAsset’s retirement calculator projects she’ll have a savings surplus if she stays on her current course. You’re 54 and you’ve saved sporadically over the course of your career. All told, you’ve got $50,000 in savings, most of it in your bank account, and because of your laissez faire attitude toward your investments, you don’t expect to ever earn more than 4%. As a talent agent in Los Angeles, you’re self-employed and have never bothered to set up a retirement account. You make $100,000 and your spouse makes $70,000 for a total of $170,000 a year, and you’ve already agreed that you will both keep working until you hit 70. When you do retire, however, you’re going to live lavishly—smoked salmon for breakfast, choice cuts of steak for dinner. Bad news: to pull all of that off, you’ll need to save $2,907 every month from now until you retire. That's about 20% of your monthly income. Compare that to the 5% per month you've been saving up until now. If you stay on that course, you'll have a savings shortfall of $660,000 when you retire - yikes! Uh-oh. This Los Angeles couple put off the important retirement decisions for too long. 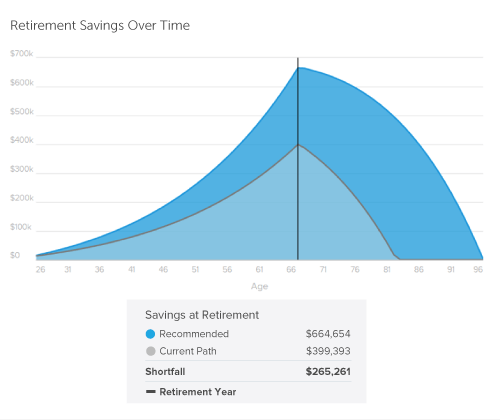 SmartAsset's retirement calculator projects a retirement shortfall of $660,118 if they don't ramp up the savings ASAP. 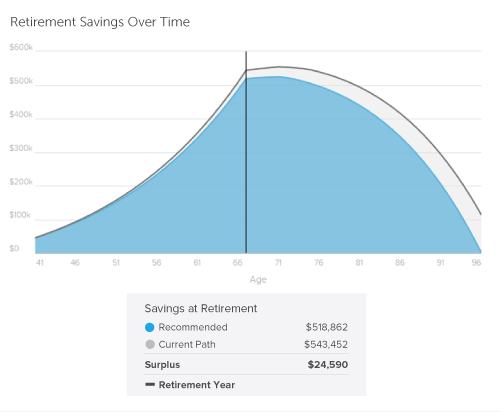 In the above scenarios, our hypothetical subjects kept their savings in one of a variety of retirement savings options, in either a savings account, a 401(k) or a traditional IRA. There are many ways you can invest the money you set aside for retirement, depending on your goals. The rate of return your money earns depends on the risk you are willing to take on, the success of your particular investment strategy and, to a certain extent, luck. For example, an economic downturn can hurt your investments, at least in the short run. So too can changes in the inflation rate, and other economic events. All of which is to say: the unexpected can happen, and often does. The best you can do is to develop a solid plan based on the information you have now. Don't let retirement savings statistics get you down. A retirement calculator can help you see how you are doing so far and what you need to change to make your retirement goals. By setting goals and meeting them, you give yourself the opportunity for a rich and rewarding retirement. Wondering where to retire? SmartAsset’s interactive retirement map can help you pick the best spot for your retirement. Zoom between states and the national map to see the best places to retire in each region, or look specifically at one of three factors driving our analysis: tax-friendliness, medical care and social life. Methodology A happy, healthy retirement depends a lot on location. To find the best places to retire, SmartAsset gathered data on three separate regional factors that affect the quality of life for retirees. First, we looked at state and local tax rates, considering two types of taxes: income and sales. We calculated effective rates based on a typical retiree earning $35,000 annually (from retirement savings, Social Security or part-time employment) and spending their disposable income on taxable goods. Next, we determined the number of doctors’ offices, recreation centers and retirement centers per thousand residents in each area. Finally, we found the number of seniors in each area as a percentage of the total population. In our final analysis, we ranked each county and city on these three factors. Then we calculated an average ranking for each area, weighting the three factors equally. The areas with the lowest average ranking are the best places to retire. Interactive: How much do you need to save for retirement?